The Who concert disaster took place at the Riverfront Coliseum in Cincinnati, Ohio on December 3rd, 1979, as part of the band's U.S. tour, the first in three years and their first performance in Cincinnati since 1975. That performance was marred by tragedy when 11 fans (Peter Bowes, 18; Teva Ladd, 27; David Heck, 19; Connie Burns, 18; James Warmoth, 21; Bryan Wagner, 17; Karen Morrison, 15; Jacqueline Eckerle, 15; Walter Adams, Jr., 22; Stephan Preston, 19; Phillip Snyder, 20) were killed by compressive asphyxia and several dozen others injured in the rush for seating at the opening of a sold-out concert. Attending the performance were a total of 18,348 ticketed fans (3,578 reserved seats, 14,770 general admission seats). The concert was using "festival seating" (also known as "general admission seating"), where the best seats are available on a first-come, first-served basis. Due to the festival seating, many fans arrived early. As they waited outside in bitter cold conditions, the crowd heard the band performing a late sound check and thought that the concert was beginning, and a rush into the still-closed doors began. Some at the front of the crowd were trampled as those pushing from behind were unaware that the doors were still closed. Only a few doors were in operation that night, and there are reports that management did not open more doors due to union restrictions and the concern of people sneaking past the ticket turnstiles. The band members would later find out about the incident after their performance ended. 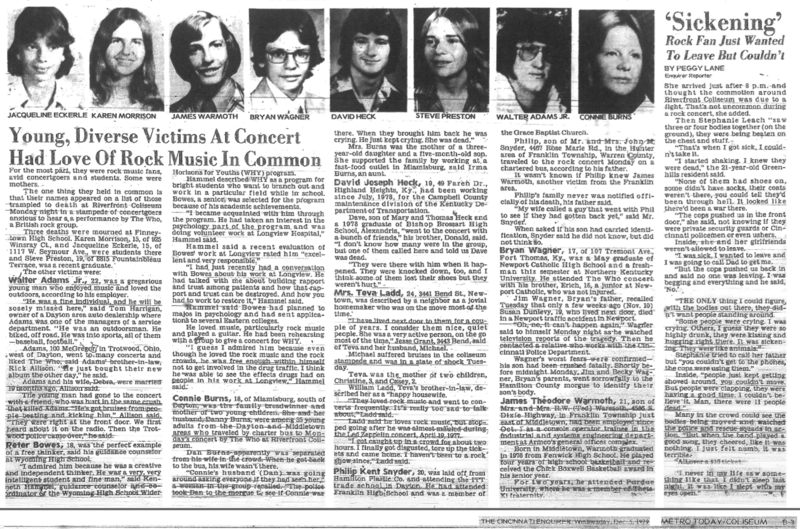 Soon after the tragedy, the victims' families sued the band, promoter, and the city until the lawsuit was settled. As a result, that festival seating was banned in Cincinnati for 25 years, with minor exceptions. 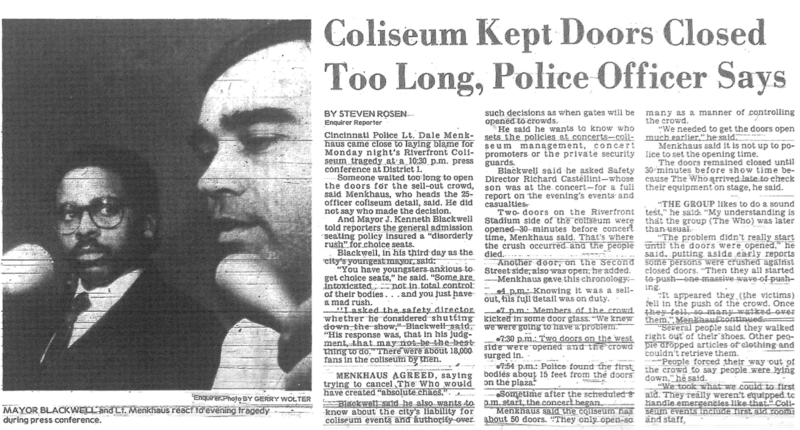 This incident was the subject of a book and of a second season episode of WKRP in Cincinnati called "In Concert."